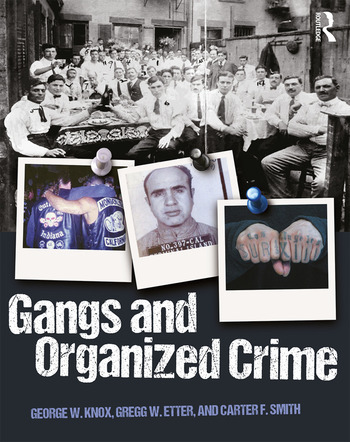 Dr. George W. Knox authored the first full textbook on gangs in 1991 (An Introduction to Gangs) and the book National Gang Resource Handbook (1995). He has co-authored several other gang books: Hate Crime and Extremist Gangs (with Gregg Etter, 2008); Gang Profiles: An Anthology (with Curtis Robinson, 2004); The Vice Lords: A Gang Profile Analysis (with Andrew V. Papachristos, 2002); and Schools Under Siege (1992). He has contributed about 10 book chapters and has over 50 journal publications, mostly on gang issues. He is the founder and executive director of the National Gang Crime Research Center and editor-in-chief of the Journal of Gang Research. He has done gang research for over 30 years, and taught gang courses for 22 years. Dr. Gregg W. Etter, Sr., Ed.D., is an Associate Professor of Criminal Justice at the University of Central Missouri. Prior to academic life, he had law enforcement experience with the Sedgwick County Sheriff’s Office. He has written extensively and presented classes on gangs, white supremacist groups, and police management topics in the United States and Canada. He is a member of the American Society of Criminology, the Academy of Criminal Justice Sciences, and the National Sheriff’s Association. He is a multiple recipient of the Frederic Milton Thrasher Award and is an editor of the Journal of Gang Research. He is the co-author of Hate Crime and Extremist Gangs (Knox and Etter, 2008). He has about 20 journal publications. Dr. Carter F. Smith, J.D., Ph.D., is a retired U.S. Army CID Special Agent and has been with the Department of Criminal Justice Administration at Middle Tennessee State University, Murfreesboro, since 2006. He is the author of Gangs and the Military: Gangsters, Bikers, and Terrorists with Military Training (2017), a multiple recipient of the Frederic Milton Thrasher Award and is an editor of the Journal of Gang Research. He received a law degree from Southern Illinois University–Carbondale and a Doctorate of Philosophy from Northcentral University in Prescott Valley, Arizona.